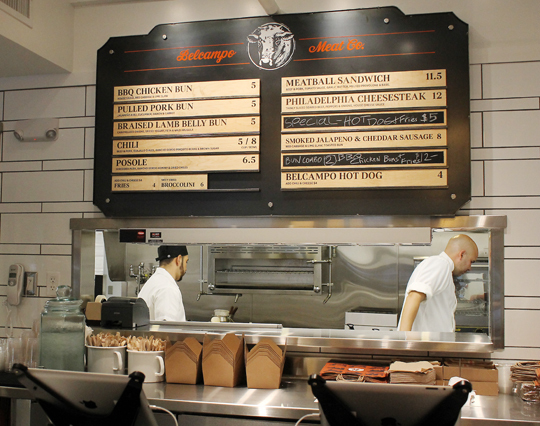 Palo Alto Welcomes Belcampo Meat Co. Pulled pork bun (front) and braised lamb belly bun (back) at Belcampo in Palo Alto. 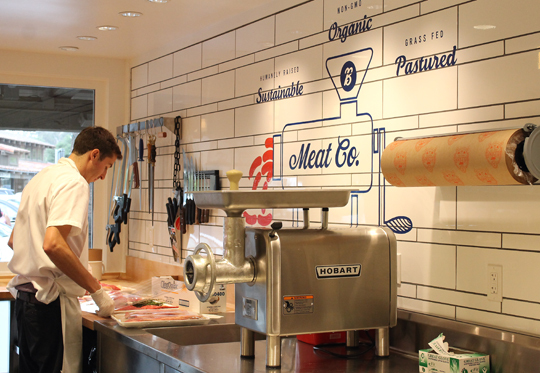 After opening its first restaurant-retail meat shop last spring in Larkspur, Belcampo Meat Co. has been on a rapid roll. Since then, it has opened in speedy succession in San Francisco, Los Angeles, Santa Barbara, and just four weeks ago in Palo Alto’s Town & Country Village. 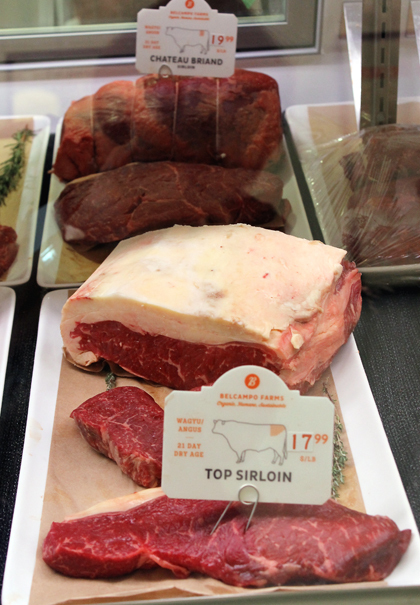 Shortly, Santa Monica will get the largest outpost of the farm-to-table meat company with a butcher shop plus a restaurant that will boast a full bar, as well as 90 seats. A lease also has been signed for a location in West Hollywood. Belcampo is on a fast-track mission to prove that sustainable not only can be profitable, but feasible on a large-scale. A butcher packs away the meat just before closing. 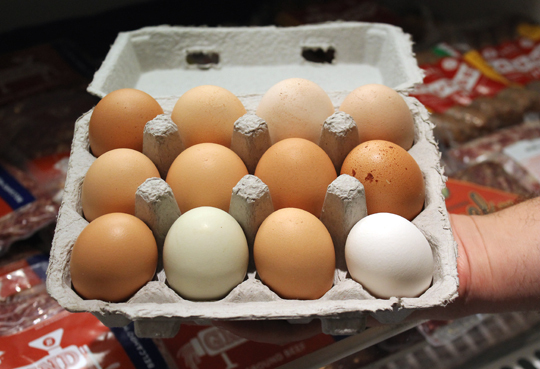 Note the whiteness of the fat on the meat — a sign of pasture-fed animals. The two founded Belcampo in 2011, which consists of several operations spread across three countries. They include: a 10,000-acre certified organic, sustainable ranch at the base of Mt. Shasta in California, where cows, pigs, chickens, sheep, rabbits, goats, turkeys, geese and squabs are raised sustainably, organically and on pasture; another cattle ranch in Uruguay; and an eco-lodge and farm in Belize that produces coffee, chocolate and rum. The goal is to have 26,000 square feet of retail space in total. It is already half-way there. Offerings in the meat case. Last week, Fernald met me at the Palo Alto location show off the store and its offerings. 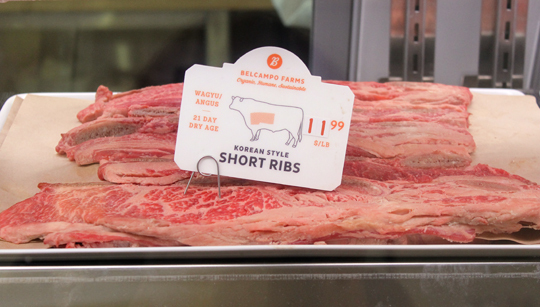 The Palo Alto Belcampo — like the Los Angeles and Santa Barbara locations — is mostly a butcher shop with limited prepared foods for take-out. There are no seats inside; only a few patio tables just outside the door. That means the focus is mostly on the butcher case. And what a case it is. Kifta skewers ($19.99 per pound) of ground lamb seasoned with rosemary, thyme and lemon zest sell-out regularly. There’s goat shoulder ($17.99 per pound), beef heart ($7.99 per pound), whipped lardo butter seasoned with herbs ($6.99 per pound), and farm-fresh eggs with vivid orange yolks ($9 for one dozen), as well as dog bones, stock bones, dry aged ground beef, tubs of bolognese sauce, and both frozen chicken and beef stocks. Not only will you find often hard-to-source items such as quail, squab, guinea fowl and rabbit, but cuts of beef you won’t see anywhere else. What’s especially helpful is that each cut is shown with a small picture of the animal, identifying exactly where on the body it comes from. Expect to pay more for such premium products, especially this year when California’s drought has led Belcampo to shell out more money on hay, and to even rent land in Arizona and Colorado for their herds to graze on. 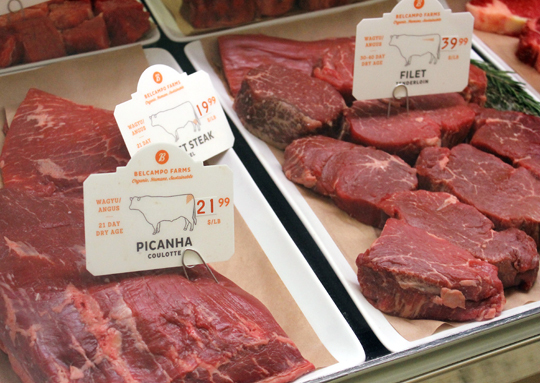 Belcampo’s meats may command top dollar, but as Fernald explains, it fits into the way more people are trying to eat these days — filling the plate with vegetables and grains while eating smaller amounts of meat of higher quality. A view into the small kitchen. 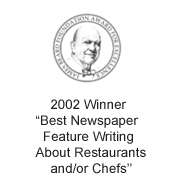 The kitchen offers a concise menu. But don’t come looking for the signature Belcampo burger served at other locations. Because there are already a couple burger joints located in Town & Country Village, Belcampo is prevented from offering that item. Still, there are plenty of other dishes sure to tempt. No matter what you order, what you notice from the first bite is the quality. The offerings are simple, and not overly adorned, in order to allow the star ingredient — the meat — to shine. Both the pulled pork bun ($5) and the braised lamb belly bun ($5) are made by braising the meat (the pork for 2 1/2 hours, the lamb for 4 1/2 hours) with aromatics but no added liquid. What makes that so astounding is biting into each to find how succulent the meat is, a testament to just how marbled they were to begin with. Both buns are palm-sized. 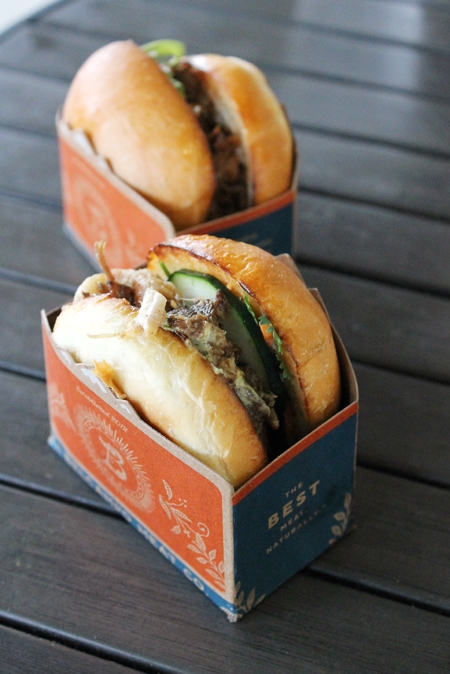 The pulled-pork is a riff on a banh mi with cilantro and cucumber. The lamb takes on a reddish hue from paprika, along with fennel seed and garlic. 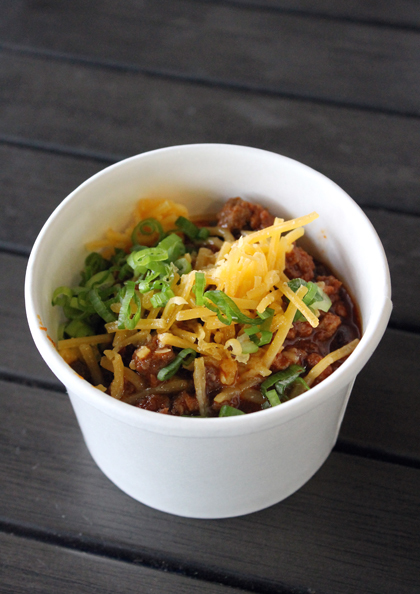 A small cup of the fabulous chili con carne. The chili con carne ($5 for a small, $8 for a large) is thick, hearty and redolent of beef, pork, guajillo chile, brown sugar and plump Rancho Gordo pinquito beans. Belcampo offers a rotating sausage special ($8). 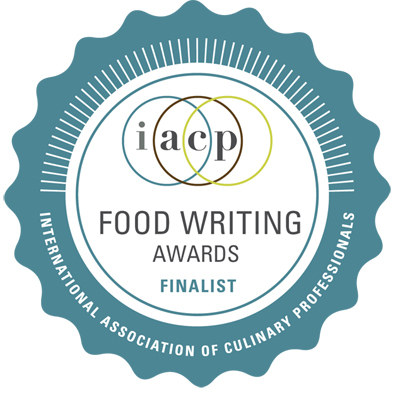 The night I was there it was a jalapeno-cheddar one on a grilled, butter bun topped with a lime-scented slaw. The sausage had a nice snap to it, and was super juicy with a kick of grassy heat at the end. 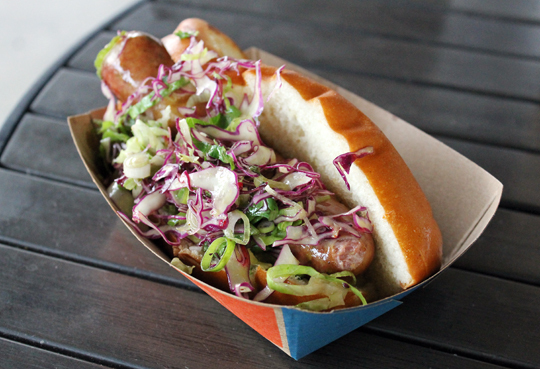 A juicy sausage with a spritely slaw. The Philly cheesesteak ($12) is a version you wish all others could emulate. Thin slices of seared beef make for a deliriously beefy bite along with tender peppers and onions. The house cheese sauce is smooth, creamy and so good that customers have wanted to add it to most everything. 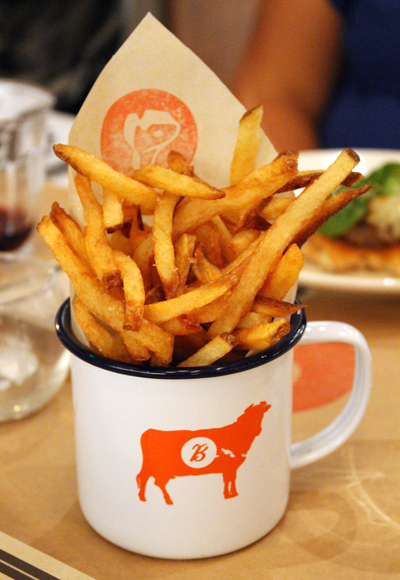 The fries ($4) are deeply golden and crisp thanks to being fried in beef fat. 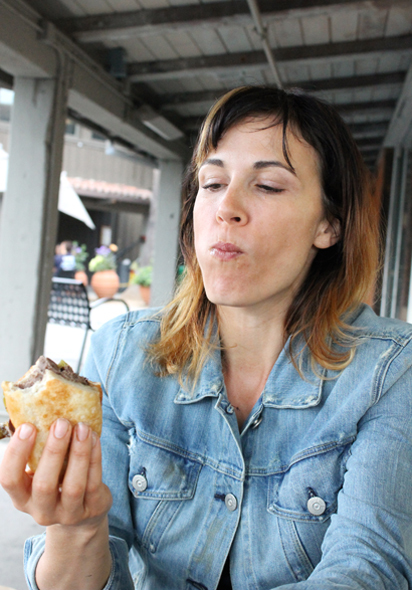 Anya Fernald being a good sport by letting me snap a pic when she took a bite of the Philly cheesesteak. A closer look at the Philly cheesesteak. 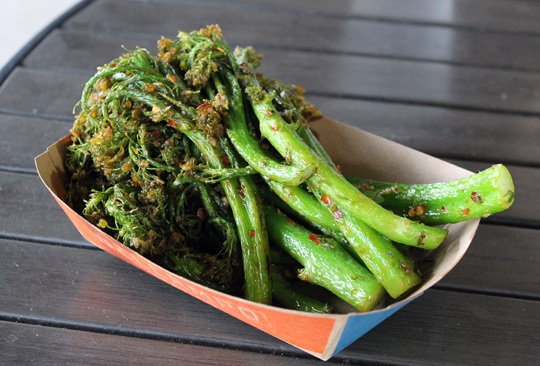 The broccolini ($6) is spicy and vibrant with chile flakes, sage, pepper and lemon zest. Lest you think you’re being healthful by ordering it, just know that it is blanched quickly in the deep-fryer, hence its brilliant green color and, well, yes, great taste. Chicken and steak salads are scheduled to be added to the menu soon. Belcampo makes it easy to come for a bite — and leave with some stellar provisions to cook with later. Now, that’s my idea of one-stop shopping. 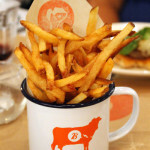 Beef fat fries?? OMG. 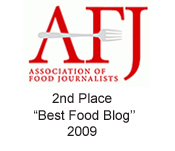 I still need to check out the one in Larkspur. Wow, that’s a lot of good looking food for a limited menu at a butcher shop. Love the idea of Belcampo. I have to drop into their San Francisco location pronto! 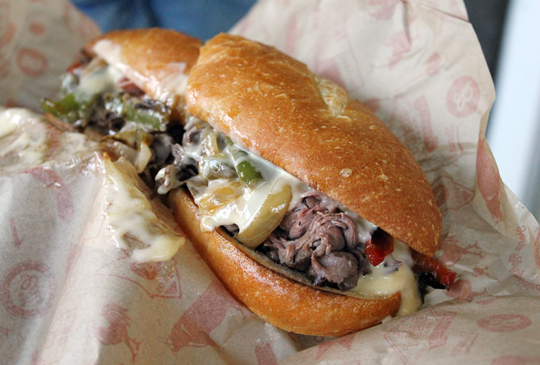 That cheesy Philly steak sandwich looks amazing! The rest of the food you shown us looks equally tasty!